There are lots of websites out there that cover our main cities or different regions, generally aimed at families living in these areas, giving info like lists of kids classes or playgroups in different suburbs. But they often have some good local knowledge for visitors too, including family friendly events that are happening or if you’re simply wanting e.g. a list of all playgrounds in a city/region (rather than those that have actually been recommended by another family as being the best!) Don’t forget to let me know about anywhere you discover that should be added as a listing on this website! First off is for any family, anywhere in New Zealand; if you’re looking for a babysitter while you’re away, whether it be for an adult night out or perhaps you need to leave the kids with someone while you’re at a wedding or party, Rock My Baby operate throughout New Zealand and come highly recommended by Kids On Board users. All babysitters listed on their website have been screened. Looking for a family friendly cafe in Otago? Have a look at this great little website https://coffeemumotago.blogspot.co.nz/?m=1 with reviews of cafes that have been visited by other families. 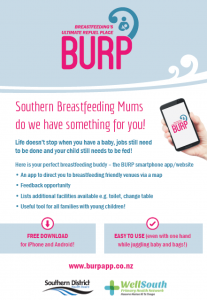 If you’re a local or travelling in Southland or Otago with littlies and looking for somewhere that is breastfeeding friendly or to change a nappy, have a look at the BURP website here. You can download the BURP android or iOS app for free. You can read reviews about the businesses listed as well as leaving your own review about your experiences. If you know of any websites that are helpful for families in a particular city or region in New Zealand, please let me know and I can add them to this list!